One of Australia’s favourite television and radio personalities, James Brayshaw is the current co-host of The Footy Show with Gary Lyon, a regular football and cricket commentator and the chairman of the North Melbourne Football Club. Brayshaw had a first class cricket career with Western Australia and South Australia that spanned almost a decade, finishing with a batting average of 42.53. 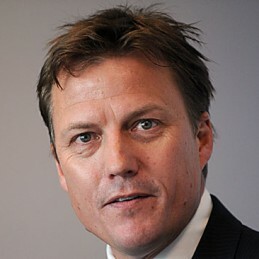 Following his retirement from cricket, Brayshaw began his media career with the Seven Network in Adelaide as the substitute sports anchor, also appearing in football programs. His football insight and humour quickly made him a fan favourite. In 2001 Brayshaw hosted the Ashes broadcast with Jeff Thompson then moved to Channel Nine when the network was awarded the AFL broadcast rights. He became the nightly sports anchor for Nine News, contributed on other sport coverage and became a regular member of cricket and football commentary teams. Brayshaw went on to host Any Given Sunday with Gary Lyon and Sam Newman which saw he and Lyon awarded with hosting duties of The Footy Show, replacing Eddie McGuire. Despite doubts of the shows future, the two quickly won over fans with their chemistry and wit. Brayshaw is also part of Triple M radio’s AFL coverage and co-host of breakfast show The Cage. One of Australia’s biggest media personalities, his personality and charm make Brayshaw an in demand MC and host.